Every girl who has her time of the month come by while going through a stressful period of time has to have some kind of a sweet tooth. I can’t possible be the only one! Well, that’s exactly what happened to me this week. Which is why I had to curb my craving for sweets with a touch (or maybe more) of deliciously sweet chocolate and salty sweet kettle popcorn. Hot chocolate isn’t just for summer. I take a packet of hot chocolate to school if I want to make myself a cup to get my chocolate fix, or I make myself a quick glass to end my meal with a sweet, chocolatey touch. Another more unique way to get your hot chocolate fix is with hot chocolate popcorn! I actually didn’t have a recipe for this, I kind of just went on a whim and put together some chocolatey things together and this was the absolutely beautiful dessert. All of the ingredients are to taste, you can use as much or as little as you want! Melt your milk and white chocolate in the microwave or in a double boiler. Pour your popcorn out onto a sheet of parchment paper. 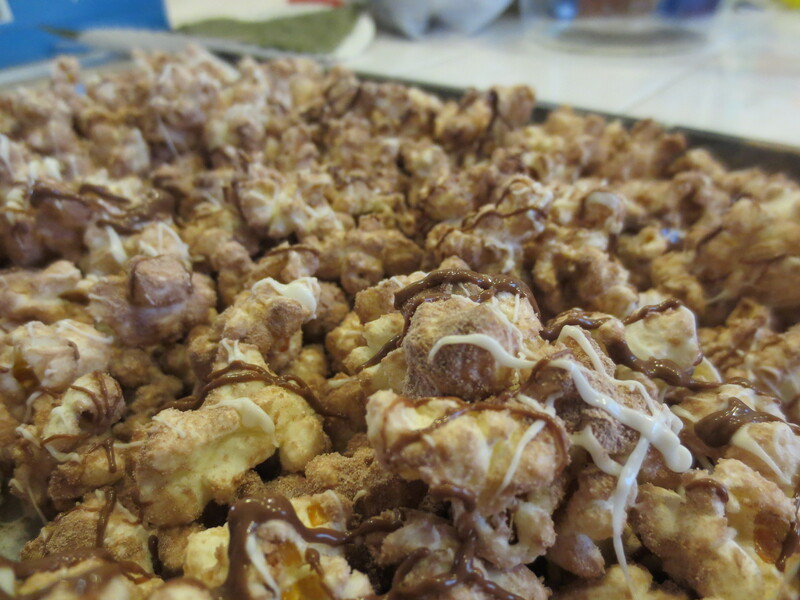 Drizzle your milk and white chocolate all over the popcorn. Liberally sprinkle hot chocolate powder over your chocolate and popcorn.